We would like to thank everyone who stopped by to show their support during our Customer Appreciation Day in Support of Canadian Mental Health. 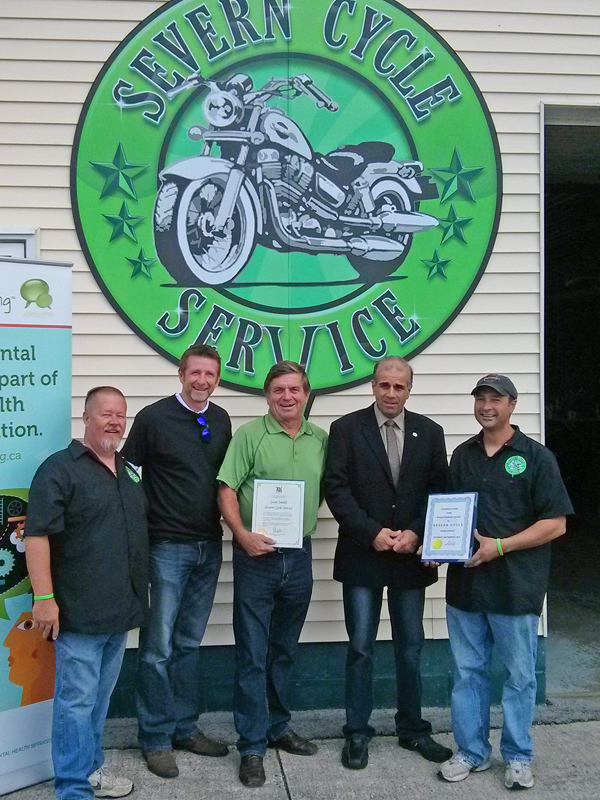 Pictured above are some supporters who stopped by: L-R: Pops, Jim Harris (Canadian Mental Health Association), Garfield Dunlop (MPP, Simcoe North), Mike Burkett (Mayor, Severn Township) & Scott Smith. See more pictures from the event, like our Facebook page! Scott Smith is the owner of Severn Cycle Service. Red Seal Trade Certified Motorcycle Technician and has 10 years of formal training and experience with motorcycle repair and fabrication. His passion and commitment to safety is second to none. We want every riding season to be a safe season. At Severn Cycle, we know that you want to be on your motorcycle, not waiting for service. Our focus is on oil; tire changes and quick repairs, for all makes and models of motorcycles. We provide quality service and honest information to ensure you have peace of mind.